Earlier this week HEXUS reviewed a set of G.Skill Trident Z Royal DDR4-3600 modules. In brief, these are Trident Z modules finished with gold or silver heatspreaders using a mirror finish, with RGB lighting embedded within a crystalline light bar that runs across the module top. Depending upon your personality, you might love or hate the conspicuous consumption these memory modules represent. If you belong to the former camp, G.Skill has a nice little accessory for you, or your loved one, a USB powered presentation box. The G.Skill Trident Z Royal Display Box (FC-UM4A-TRK) is listed on the G.Skill website, all on its own under the products > accessories category. 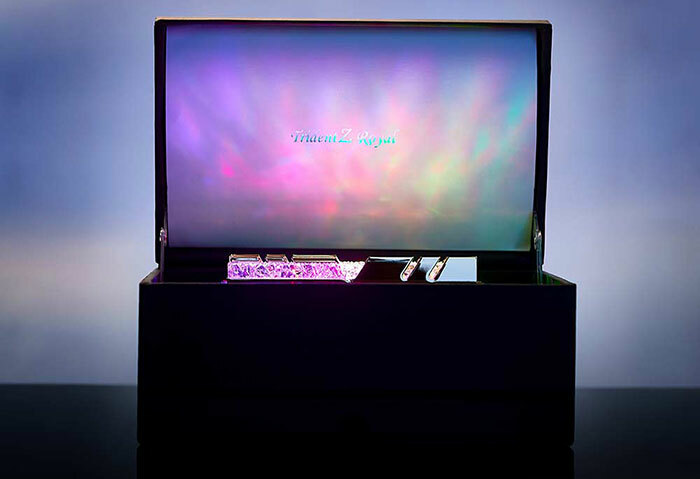 The promotional blurb describes this jewel box style case as "the perfect accessory to put your Trident Z Royal or Trident Z RGB memory kit on display". You can see that there are four DDR4 slots in the main chamber of the box. As well as securing the modules in place for transport, these slots provide power, as the box can be plugged into a USB power source. In the pictures you can see that a disappointingly ordinary USB cable is provided for this purpose, and it resides in the case's bottom drawer with the Trident Z Royal microfibre cleaning cloth. If you connect up any USB power source (USB-to-microUSB cable provided) the G.Skill Trident Z Royal DDR4 memory modules will show off their default RGB lighting effects. 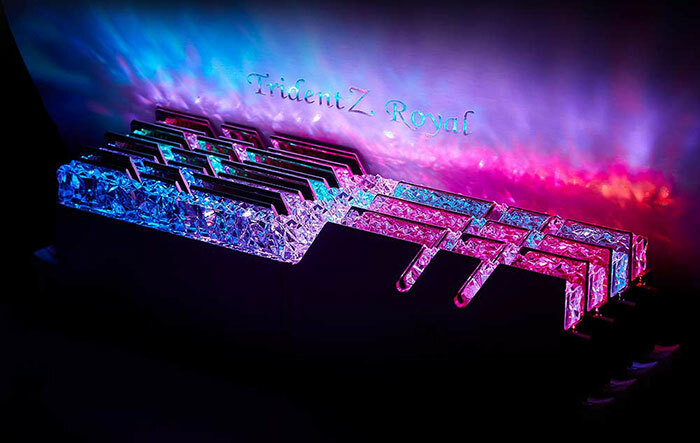 An example of the awesome spectacle of a set of G.Skill Trident Z Royal DDR4 memory modules lit up, is provided in the video below. The promotional video features the memory modules in gold and silver in various installations but I think it was created before this box became available. With the G.Skill Trident Z Royal DDR4-3600 16GB kit that HEXUS tested retailing for around £200, more than twice as much as vanilla DDR4-2667 of the same capacity, one might expect G.Skill to bundle this display box with some of the kits. Some pricing guidance for the display box is provided by the Taiwanese online retailer PCHome, which has the box on offer for NT$1700, or about £42. Buyers get a one year guarantee. It's just a crazy expensive gift box! I mean in the world of the rich, being handed RAM as a gift and presented in this… …would actually be very nice.